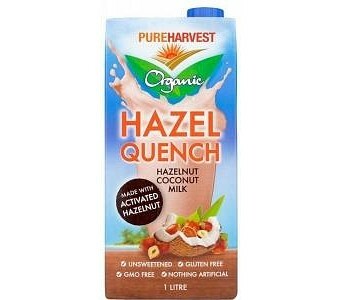 Pure Harvest Organic Hazel Quench is a delicious non-dariy milk that offers a creamy and sweet-nutty flavour without any artificial flavours or sugars. Whole organic hazelnuts are activated to deliver a mylk that is high in nutritional value as well as flavour. Ingredients: Filtered water, Organic Coconut Milk (10%), Organic Brown Rice, Organic Activated Hazelnuts (4%), Sea Salt.